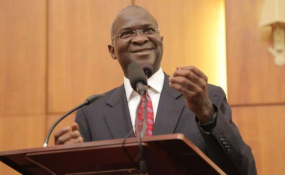 The minister of Power, Works and Housing, Babatunde Fashola has stated that accidents on Nigerian highways are not always the result of bad roads as claimed by road users, but largely due to over speeding and recklessness of drivers. In a statement made available to LEADERSHIP, Fashola who made the observation in Abuja at a Capacity Building Workshop on the Activation of the five (5) United Nations' Convention on Road Traffic acceded to by Nigeria, noted that no driver speeds on bad roads. He stated that the workshop underscored the importance and commitment of President Muhammadu Buhari's administration to the safety of lives of all Nigerians. The minister maintained that accidents that occur daily on our highways is of serious concern to his ministry, stressing that there is no state in Nigeria that the federal government is not executing one road project or the other. He added that his ministry would soon embark on massive deployment of manpower for the erection of additional road signs which will ultimately provide the guide, support and direction for road users. While noting the reduction of road crashes on our highways, the minister charged the Federal Road Safety Corps (FRSC) to intensify effort on public enlightenment campaign, orientation and education of drivers to ensure safety of lives and properties. Earlier, the permanent secretary, Federal Capital Territory, Sir Chinyeakaoha on behalf of the minister, Mohammed Bello, lauded the officials of the FRSC for recording tremendous success in the reduction of road accidents, stressing that the Federal Capital Territory Administration would continue to provide the necessary support to ensure that roads within its jurisdiction is made safe for users. In his vote of thanks, the FRSC Corps Marshal, Dr. Boboye Oyeyemi disclosed that his organisation would not have flourished successfully if not for the support it enjoys from stakeholders in the road and transport sector. He also expressed immense gratitude to the United Nation's Envoy for sponsoring the Capacity Building Workshop.